The weather is becoming cooler and we need to find toys that encourage our children's imagination and at the same time teach them about the world around them. These CAT style Job site machines will be enjoyed by all the children, especially boys as they imitate construction sites and play. 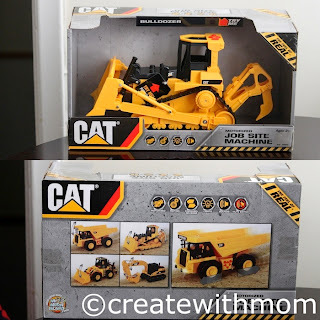 The toy is constructed in a well thought out manner as it has motorized driving features with push buttons on top of the bulldozer, so it can go forward and reverse. There is also a lever to make the pulley in the machine go up and down. 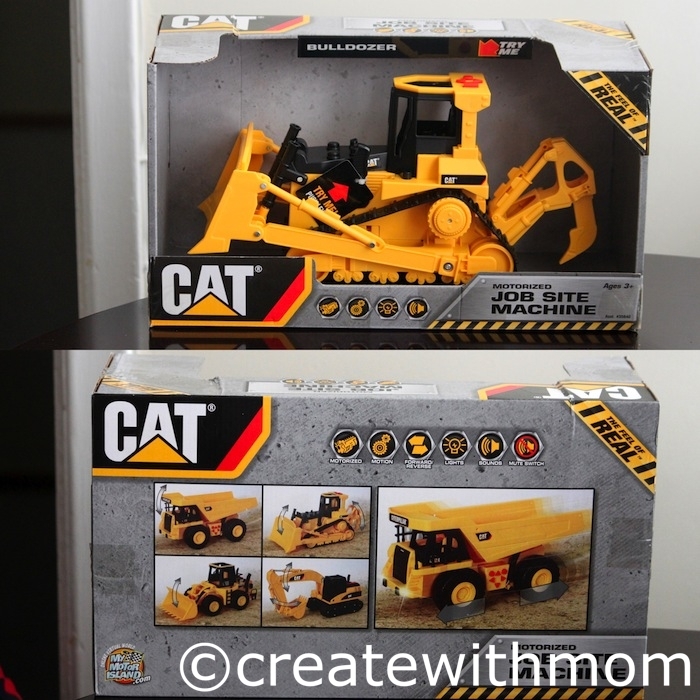 I enjoyed watching my son show me how everything in this bulldozer works and all the things he can do with it. There are working double signal lights that flash and a stop button that interrupts the vehicle from moving as well. My son enjoys the sound effects and the instruction of the foreman when he presses the buttons. I appreciate that the designers of the toy thought about the parents and put in a mute button on the bottom of the toy so it can be played without the sound :) The toy comes with the 3AA batteries that are needed for the sound and motorized driving. This toy has become my son's favourite. There is a wide assortment of these machines such as dump trucks, wheel loaders and excavators available at Amazon, Kmart, Walmart, Toys R Us and Target. This is a wonderful toy for any child, and I am glad to host a giveaway that ends on October 26th, open to everyone in Canada and US. Please enter through the rafflecopter below. I am located in London, ON, Canada! I am in Canada! My boys would LOVE this! i am a crazy canuck from Saskatchewan! !